Bucherer unveils a custom motorcycle produced in Switzerland in cooperation with the family company Bündnerbike. 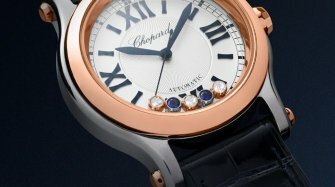 Dressed in blue, this unique piece featuring two safes housing a watch and a ring is worth CHF 1.888 million. The Harley-Davidson Blue Edition is based on a Harley-Davidson Softail Slim S. However, there is not a great deal left that is reminiscent of the initial model with its cool vintage style. Every metal element found on this one-of-a-kind motorcycle has been produced, welded, beaten, ground and polished by hand. The complete frame of the motorcycle is welded seamlessly, and even the rims are custom-made. The rotating camshaft is visible through a window in the camshaft housing, as are the valve control and the gold-plated throttle valves. Heat-resistant LED lights illuminate the scene. The Harley-Davidson Blue Edition is thus the world’s first motorcycle to have a motor that is lit up from the inside. Various parts of the motorcycle are also gold-plated. The cowhide saddle has been sewn by hand in Switzerland. A special detail: the iridescent colour. 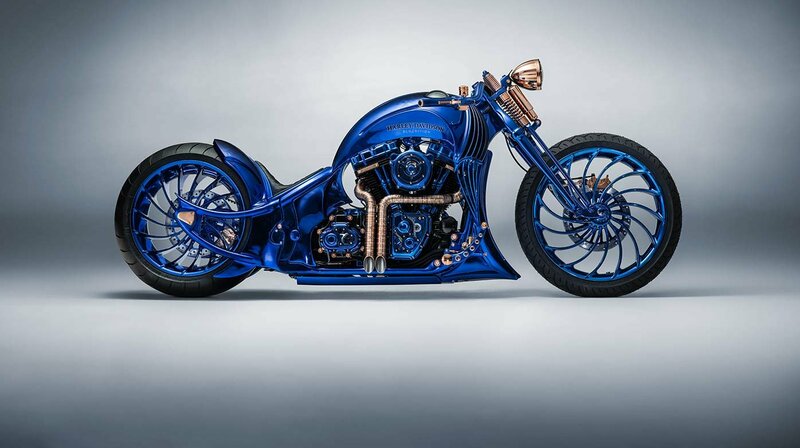 A specific technique had to be employed to illuminate the Harley-Davidson in this intense blue. In a first step, the entire motorcycle was silver-plated, before six colour coatings were then applied using a secret coating method. This unique piece is perfected by the incorporation of the arts of watchmaking and jewellery making. This is also a world first: never before have a manufacture watch and jewels been integrated in a motorcycle. The Dizzler rotating ring from the Bucherer Fine Jewellery collection was adapted for the Harley-Davidson Blue Edition to allow it to be mounted on the hand grips. “That was a technical challenge,” says Jürg Ludwig Jr, Managing Director of Bündnerbike. “To ensure that the rings really stay in place, a special method was applied that guarantees a very strong hold. How this works remains a secret of the Bündnerbike blacksmith,” explains Ludwig. A further pair of Dizzler diamond rings can be found on the forks, while a large version of the Dizzler ring is located in the left half of the tank. Underneath a glass dome made from armoured glass, another piece of jewellery of special value can be found in a retractable safe: a six-prong Heaven solitaire ring with a 5.40-carat diamond. 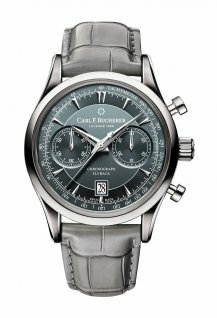 This is also a unique feature, as is the watch from Carl F. Bucherer at its side. This special custom-made watch, which is based on the Patravi TravelTec II model, is located in a second safe in the right half of the tank. The dial of this unique piece is adorned by elements of a motorcycle engine. To ensure that the vibrations of the engine do not damage the mechanical movement, the watch is housed in a cage with an elaborate holder made from silicon rings. 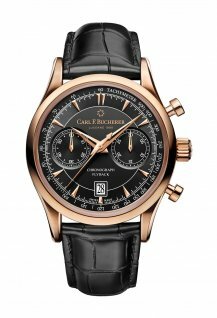 “It was a long road,” says Samir Merdanovic, Head of Manufacture Movements at Carl F. Bucherer, about the development process, which demanded a great deal of thinking. “The holder, for example, also serves as a watch winder. The watch is therefore wound regularly and continues to run, even if the motorcycle is not ridden for an extended period,” explains Merdanovic. With all of these elements, the Harley-Davidson Blue Edition is testimony to the passionate spirit, the comprehensive design understanding and the openness to new ideas of the Lucerne-based family company. 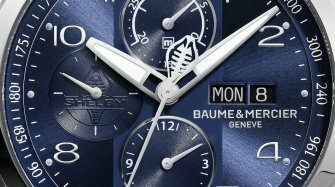 It is the addition to the Bucherer Blue Editions watch collection, created in cooperation between Bucherer and the most renowned brands in the watchmaking industry. Inspired by the colour blue, the corporate colour of the Lucerne-based jewellers, outstanding timepieces from the best manufacturers are created for the collection. “We are pleased to be able to contribute our long-standing experience and close relationship with our partners in order to create exclusive and unique watches and products as part of the Bucherer Blue Editions, which are exclusively available at Bucherer. This allows us to appeal to customers around the world who want to stand out from the crowd and live the Blue Editions lifestyle,” says Patrick Graf, Chief Commercial Officer at Bucherer. 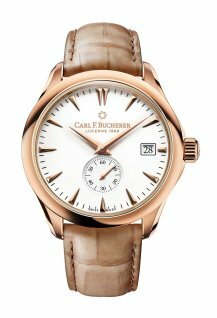 There is no doubt about it: the world can look forward to further surprising, first-class innovations and luxury products from Bucherer. The Bucherer Blue Editions collection includes 17 wristwatches, which each stand out thanks to unique features and consummate craftsmanship. With the Harley-Davidson Blue Edition, the collection is now being supplemented by a luxury product that shares these values: the handcrafted Harley-Davidson worth CHF 1.888 million includes three world firsts: it is the world’s most expensive motorcycle, it is the first motorcycle to be embellished with a manufacture watch and jewels, and it is the first motorcycle with an engine that is lit up from the inside. Bucherer combines the best traits of the Swiss watch and tourism industries, having honed its experience in offering warm hospitality and excellent service over the past 130 years.